"It reminds me of a colorful Tibetan cabinet," says Aldo Cibic about this two-door wardrobe with a red lacquered ashwood frame and mirrors in sterling board with silkscreened ethnic decorations. A joyful and refined reinterpretation of a traditional Tibetan wardrobe. Modernist built-in wardrobe with swing doors. 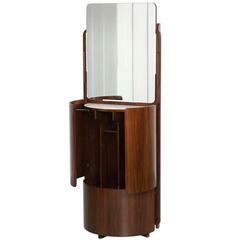 High quality hand crafted wood with high glossy lacquered finish. The inside space with veneer wood in different nuances and wood finishes. 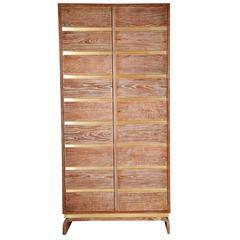 19th century Italian painted wardrobe in pitch pine wood with drawer, 1890s. Originaler alter Einbauschrank mit Türen aus Deutschland um 1920. Originalfarbpatina und ganz besondere Beschläge in Sternform. Maße: 210 cm hoch, 150 cm breit, 10 cm tief.